However, I did notice something else. If you look at the screen capture, the red box contains a blow-up of the Detail’s panel. It shows the Luminance and the Color sliders pushed to 100%. However, the Detail and Contrast sliders are dimmed and non-adjustable. At first I thought it was still disabled just like the previous Beta, but then I tried to open a PSD file in the Beta 2 and the sliders magically came alive. So there is still an issue with Lightroom 3 Beta 2 and the Canon 7D Raw files. I am very curious if other Raw files are treated in the same way. Are you sure you’re using the new raw processing engine? These options are disabled when using the old engine. I do not have Lightroom (version 1 or 2) installed on this workstation, so the old processing engine is not an issue. If you put your raw files somewhere I can try to have a look. It is a public beta. 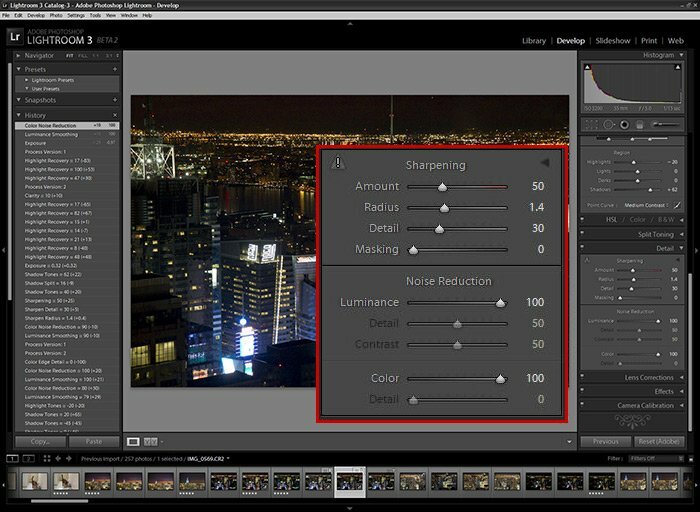 Download Lightroom 3 direct from Adobe and test it with your own files. As I said, I don’t have this issue with my files (detail and contrast options are available). I can clearly see the difference between the 2003 processing engine (LR2) and the 2010 version (LR3 Beta). 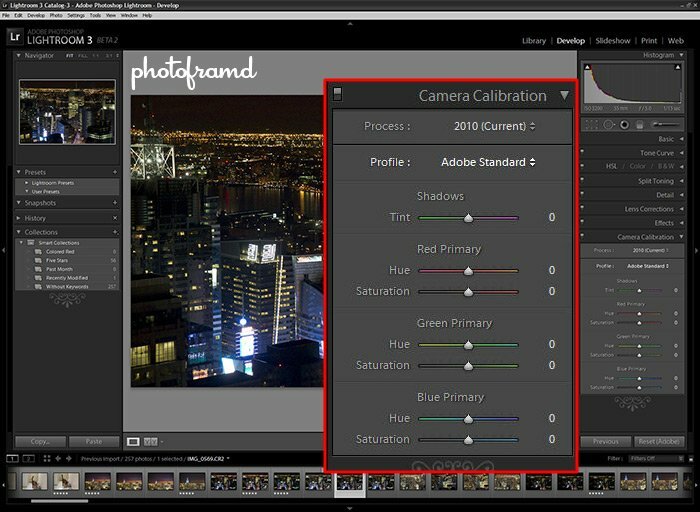 I can only recommend you to check the “Camera calibration”->”Process” or “Settings”->”Process”and verify it’s set to “2010 (current)”. I just added that screen. It does say “2010 (Current)”. As I said before, I never had Lightroom 1 or 2 installed on this XP64 workstation. Maybe it is an issue with the 64-bit code or compatibility. I guess you found a bug and it’s time to report it to Adobe. I was also having trouble with Canon 7D files and LR ver 2.7 . I found that most (not all) of my problems went away when I chose CAMERA NEUTRAL as my profile as opposed to ADOBE STANDARD. Of all the profiles, ADOBE STANDARD was the worst. Of all the profiles, CAMERA NEUTRAL was the best. I offered a particularly bad RAW file to Adobe to maybe help them make improvements but they haven’t replied saying they want the file. I do not have much hope in Adobe fixing Lightroom 2 and Camera Raw 5.X. Adobe is focused on next generations and will probably force us into buying these new products in order to get working Raw files. That is the way they handled it in the past anyway. The good news is the latest version of Lightroom 3 is actually surprisingly good. I will be posting a new review using new Canon 7D Raw files on Friday.